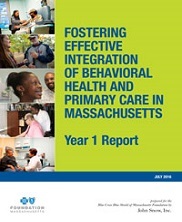 In December 2014, John Snow, Inc., (JSI) began working with the Blue Cross Blue Shield of Massachusetts Foundation to evaluate Phase One of the Fostering Effective Integration (FEI) of Behavioral Health and Primary Care in Massachusetts grant program. The Foundation funded 10 primary care and behavioral health organizations with established integration programs to identify success factors, barriers, challenges, and opportunities for change. These findings subsequently informed a longer-term Foundation investment in and evaluation of integrated care services (Phase Two).